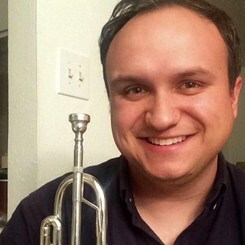 Justin holds a Bachelor of Music degree from Texas Tech University, where he studied trumpet with Will Strieder and music education with Dr. Keith Dye. During his time there, he was a member of the Texas Tech Symphonic Wind Ensemble (which was a featured performing group at the annual Texas Music Educator's Association conference), the Texas Tech Jazz Ensemble, brass quintets, and the Goin' Band from Raiderland. A Dallas native, Justin began playing the trumpet in 6th grade and, during his musical upbringing, was a member of the Greater Dallas Youth Wind Symphony and Mesquite Symphony Orchestra. Since graduating from Texas Tech, Justin has lived in the Dallas area and has been a music educator and performer in various roles. He is passionate about music education and enjoys helping people discover music.